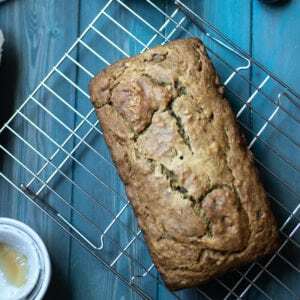 Recipe for moist, healthy whole wheat banana bread made without refined sugar. In mixing bowl, sift flour with baking powder, baking soda and salt. In large mixing bowl, combine oil, honey, vanilla and egg. Add in mashed banana and mix well. Stir dry ingredients into wet ingredients until just combined, being careful not to over mix. Bake for 40-45 minutes, or until set. Cool 10 minutes in pan and then remove from pan and finish cooling before slicing. Maple syrup can be used in place of honey. Feel free to use all purpose or white wheat flour instead of whole wheat flour. Canola oil can be used instead of coconut oil.